Thaw frozen spinach. Place in skillet over medium to medium high heat; cook for about 10 minutes. Drain and set aside. In large skillet, sauté onions in the oil for about 5 minutes. Add the garlic paste. 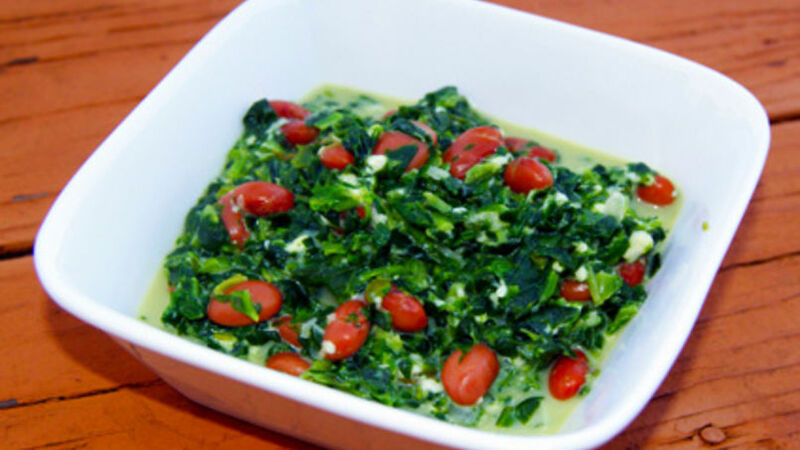 Stir in spinach and cheese. Stir in half-and-half, and cook for about 3 minutes. Add the beans and simmer for 5 minutes. Serve it as is, or with rice – simple, easy and delicious! You can omit the beans and use the filling in enchiladas. You can also add a bit of salsa to the Quelites con Frijoles, and use the filling to make a delicious burrito. I’m not a vegetarian, but sometimes I don’t feel like eating meat. There are days when I just want something lighter, and this is one dish I make when I’m feeling that way. It’s made with beans and spinach, so I still get the protein that I’d be getting if I were to prepare a dish with meat. I also like that it’s versatile and can be used in several different ways!